The platforms on the B & C Lines need upgrading & strengthening anyway. They are falling apart & crumbling!! That is because the 7's were outfitted with LED lights, which make them so cheerfully brighter. And you're right! The 8's interiors ARE becoming so dimly lit!! Nothing like the interiors of the new Red & Orange Line Mockups!! Those are also cheerfully bright, warm & cozy!! They are planning to eventually replace the whole fleet of Green Line trolleys anyway. Just like what they are doing with the Red & Orange Line fleets. Sometime in the future, we will have the only transit agency in the country that will have THE YOUNGEST NEW rapid transit vehicles on all subway lines!! Last edited by Jahvon09; 04-15-2019 at 04:55 PM. Sometime in the future, we will have the only transit agency in the country that will have NEW rapid transit vehicles on all subway lines!! By the time all the Type 10s will be delivered, the Blue Line cars will be up to 23 years old. Not that old...the 0700's were delivered 2007-2009, meaning some of them haven't hit a decade yet. The Type 10's should not take an enormous design gestation period if they're going to be modified off-shelf instead of an entirely unique-to-Boston design, so it's hard to see back-end of the deliveries stretching much beyond 2025. That timetable is dicey enough for expecting fast-fading Breda reliability to hold up, so they're not in a mood to waste time with that procurement. These fresh-rebuilt Type 7's are going to be the only thing keeping the system from completely melting down forever in the meantime. As for Blue fleets...they're kicking off "BLT" anyway with the Blue infrastructure + climate change resiliency study underway now. Initiatives related to flood protection for stations and ROW include new signal system (retiring the hardware- and electricity- intensive mechanical trip system for solid-state tech), installing third rail from Logan to Wonderland and ripping out the overhead wire (fortifying vulnerability to wind events), and performance optimization off the new infrastructure. Siemens Mobility, for all its success in light rail and passenger RR's, has a very meager track record in heavy/metro rail, and their indifference to that market showed during the 0700 design-build process. Very unlikely those cars will be rebuilt, as it's too much easier and cheaper to order up 100+ more CRRC Orange/Red carbon copies shoved into Blue Line dimensions and live off the same parts stock rather than try to keep maintaining the only unlike HRT fleet left. Could even use that opportunity to order up a few Orange supplementals while they're at it. One thing they might end up looking at closely is how a mandate to proceed on Red-Blue could affect timing of the "0800" car order. The Charles extension would retire Bowdoin Loop and blast straight through the wall framing the loop, eliminating the #1 dimensional constraint on the line forcing use of such tiny (48.5 ft. / 35 seat) cars that seat less each than a 40-footer bus. It's not enough by its lonesome for the R-B build and retirement of the loop to allow for bufffing Blue out to running Orange Line (65 ft. / ~48 seat) dimension cars instead; "BLT" would have to study curve easing feasibility at State St. curve to whack the last substandard dimensional constraint. But at the very least, the next order could go for healthy bit bigger dimensions and seating capacity than today if R-B gets fast-tracked. And on the slim chances they actually do hit paydirt on mods to State for "off-shelfing" Blue to real Orange dimensions--and no longer need to deal with pantographs or signaling differences--they could buy a kajillion more CRRC cars for a song and slovenly pad the order knowing that flatbed trucks traveling between Wellington and Orient Heights and an ornamental color change in the shop are the only prerequisites for trading assignments or following which line the most future growth is headed. So there's serious per-car capacity gains to be quantified, and the issue of timing re: whether Red-Blue is the priority Pollack says it is, behind the decision on when is the time to send the Siemens cars to a slightly early retirement. I expect "BLT" could morph into something much bigger, more comprehensive, and more prominently branded for publicity than just the sea level rise resiliency study that's going on quietly right now. 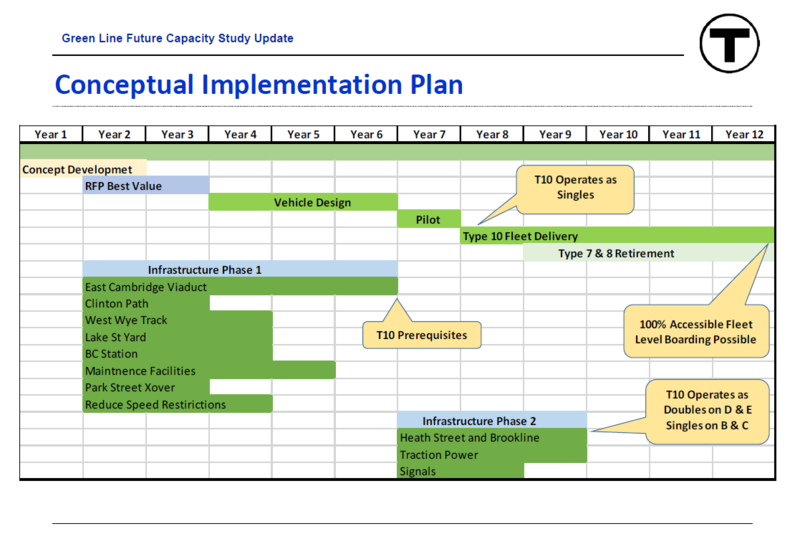 I'm going off this slide from last year's Type 10 presentation, which doesn't envision Type 10 deliveries as starting until 2024/5. And on the slim chances they actually do hit paydirt on mods to State for "off-shelfing" Blue to real Orange dimensions--and no longer need to deal with pantographs or signaling differences--they could buy a kajillion more CRRC cars for a song and slovenly pad the order knowing that flatbed trucks traveling between Wellington and Orient Heights and an ornamental color change in the shop are the only prerequisites for trading assignments or following which line the most future growth is headed. Don't forget the Blue Line has a lower platform height, because of the harbor tunnel. So a little more complicated than a paint job. Not really. Floor height is controlled by the car hydraulics so there's a vibration-dampening cushion above the trucks. It's adjustable. When the T was entertaining rebuilding some of the Blue Line 0600's to send to Orange as supplementals that could trainline with the 01200's, ballast adjustment would've raised the floors to Orange platform level without outside mods. Sorry, but that is just like putting money into a 15-y-o-car that sat for eons inactive to update it to like new standards, especially when just about everything mechanical has to be fixed or replaced on it. A money pit! !